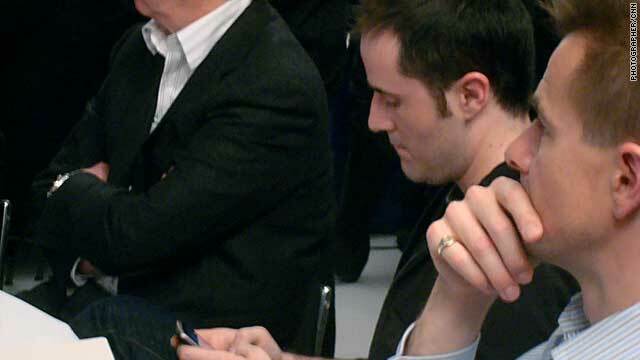 Twitter co-founder Evan Williams finds time to use his own service during the social media discussion at Davos. Davos, Switzerland (CNN) -- The great and good from the world of social media met Wednesday at Davos and agreed their medium still hasn't reached its full potential, with one speaker joking that the really cool stuff wouldn't happen "until we're dead." This is a frightening prospect when one considers how much our digital and real lives have blurred already. Seven of the 15 most trafficked Web sites in the world are social sites, according to George Colony of Forrester Research, a technology specialist. He said: "From our data on the 'Y' generation, that's people between 18 and 28, versus the 'X' generation, which is people between 29 to 40, you still see incredible velocity towards this new media. "We now spend between five and six hours per day on media and that is the second biggest human activity after sleeping!" To put this in perspective Colony said Facebook enjoys something like 130 million unique visitors per day, while Twitter has around 25 million visitors. MySpace CEO Owen Van Natta explained to the assembled audience, which included Twitter co-founder Evan Williams and the World Wide Web inventor Tim Berners, that the Web is becoming increasingly social. "That means we can experience all the things that we do on the Internet with other people," he said "This is very much like what exists in the real world. We want to go and experience communication and media content with other people." Pointing to the success MySpace has had in allowing people to share music, film and games, he explained that the distribution of content is now happening much more through people than traditional portals on the Internet. "So I'm now able to engage in my media content consumption with other people that I never was able to do before," he said. "This provides a much richer experience." Twitter's Evan Williams explained how people have used a number of social networks to respond to the humanitarian crisis in Haiti by creating groups with like-minded people. He said: "It's a fact more people are doing stuff because they're motivated by others they're connected to, instead of sitting alone in their apartment doing nothing." He said the role of Twitter has been to give these people the tools to find the information they need, to create and publish their own content and then to build relationships to share it with others. However, the issue that divided opinion was privacy and how our personal data can be shared. Last year Facebook came under fire from bloggers and rights groups over its decision to adjust its privacy settings, a move which would dramatically increase the amount of personal information people expose online. The company said the changes would help streamline privacy controls that have confused many of its 350 million users and were sprawled over six separate pages. But according to the Electronic Frontier Foundation, "these changes are especially worrisome because even something as seemingly innocuous as your list of friends can reveal a great deal about you. "In September, for example, an MIT study nicknamed 'Gaydar' demonstrated that researchers could accurately predict a Facebook user's sexual orientation simply by examining the user's friends list." Don Tapscott, an expert in technology and business and society, told the audience that shared information could ultimately be used against users. "An employer could carry out a 'reference check' using someone's Facebook account and then decide against hiring on the basis of content that is not necessarily representative of that person," he said. But Reid Hoffman, the founder and executive chairman of LinkedIn, responded by saying that privacy concerns tend to be "old people issues." He said: "If you actually look at most young people using Facebook etc, they put their cellphone numbers on their profile a little less these days. "The value of being connected and transparent is so high that the roadbumps of privacy issues are much lower in actual experience than people's fears." This point was articulately reinforced by one African delegate who said social networks had given her a voice in the world and contacts that would otherwise have eluded her.